MANILA, Philippines – The November 2016 Nursing NLE board exam results or the Nurse Licensure Exam list of passers, top 10 examinees, top performing schools and related announcements are available at this website as PRC officially released the results online twelve (12) working days after the last day of board examination. As announced, 6,836 out of 14,322 passed the exams. The licensure exams are administered by PRC Board of Nursing headed by its Chairman, Marian Grace A. Gascon and its members Gloria B. Arcos, Carmelita C. Divinagracia, Carfredda P. Dumlao, Glenda S. Arquiza, Florence C. Cawaon and Cora A. Anonuevo on November 26 & 27, 2016 at PRC testing centers in Manila, Baguio, Cagayan De Oro, Cebu, Davao, Iloilo, Legaspi, Lucena, Tacloban, Tuguegarao, Pagadian and Zamboanga. The schedule of online appointment for issuance of Professional ID and Certificate of Registration will be from January 9-13, 2017. According to the Commission’s Resolution No. 2015-948 series of 2015 entitled “Schedule of Licensure Examination for Year 2016”, the target release date for the results of November 2016 Nursing board exams will be on January 8, 2017 (Sunday). However, results may be released earlier or later without prior notice. On the same exam conducted by PRC on June 2016, results were out after nine (9) working days working days. During NLE conducted November 2015, results were released after twenty-four (24) working days while sixteen (16) working days during May 2015. The November 2016 Nursing licensure examinations covered topics from Nursing Practice 1 Basic Foundation of Nursing and Professional Nursing Practice, Nursing Practice 2 Community Health Nursing and Care of the Mother and Child, Nursing Practice 3 Care of Clients with Physiologic and Psychosocial Alterations (Part A), Nursing Practice 4 Care of Clients with Physiologic and Psychosocial Alterations (Part B), and Nursing Practice 5 Care of Clients with Physiologic and Psychosocial Alterations (Part C). Anatomy and Physiology, Pathophysiology, Pharmacology and Therapeutics, Nutrition and Diet Therapy and Parasitology and Microbiology are also integrated at above-mentioned topics. During June 2016 Nursing board exam, 6,183 out of 14,184 examinees passed. West Visayas State University - La Paz ranked first in the list of top performing schools having 96 out of 96 examinees passed or and equivalent 100% overall passing rate. WVSU was followed by Bicol University Legazpi having 73 out of 82 examinees passed or 89.02% passing rate. Meanwhile, Bernard John Ezra IV Rafols Icamen from Cebu Normal University (Cebu State College) and Melissa Castor Malong from De La Salle University - Health Sciences Institute topped the exams garnering 87.20% rating. Complete list of topnotchers here. 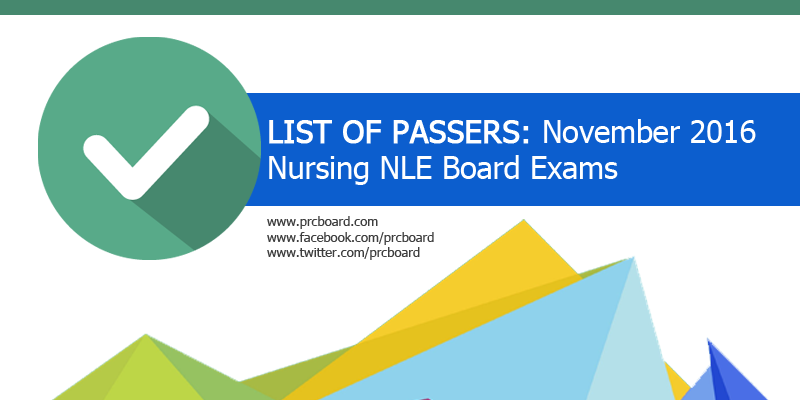 To receive up-to-date news about November 2016 Nurse Licensure Exam (NLE) results, we advise our visitors to bookmark this page, visit PRC official website or follow us at our social media pages via Facebook and Twitter.